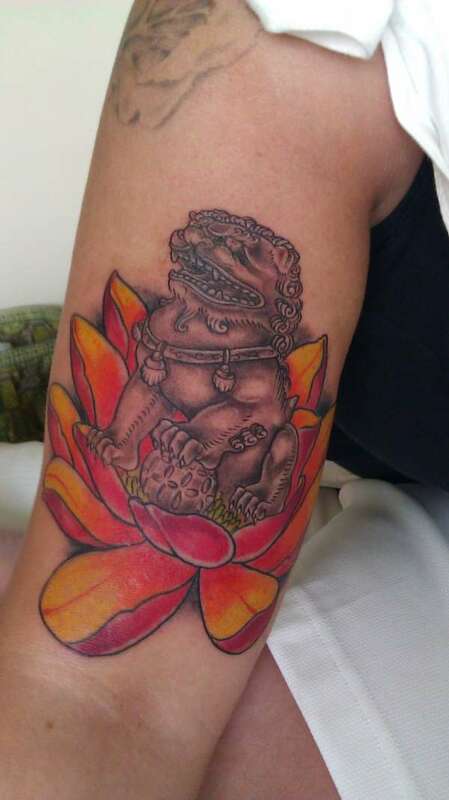 My fiance and I each got a Chinese Foo Dog this Saturday in Ft. Lauderdale at Tatoo Blue's. Alex was amazing. We took up his whole day. He drew them out exactly how we wanted them. We both have other work. This is only my 2nd color piece. We love them!! Mine faces hers. We have different colored Lotus. Very Original and Very Cool – Love the Design Idea – Combining both Full Color and a Gray Scale WORKS. I have a Lotus as Well and Love the Foo Dog!